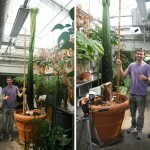 Perry the Corpse Flower (Amorphophallus titanum) continues to grow his/her solar antenna at an astonishing rate, as shown in the accompanying photographs – click on the thumbnails for the full photos. The photos include Tran Tuan (Gustavus ’13, current Perry student scale object), Anthony Cesnik (Gustavus ’12, returning scale object), and Alex Burum (Gustavus ’07, the ur-scale-object, back for an encore performance on August 9). 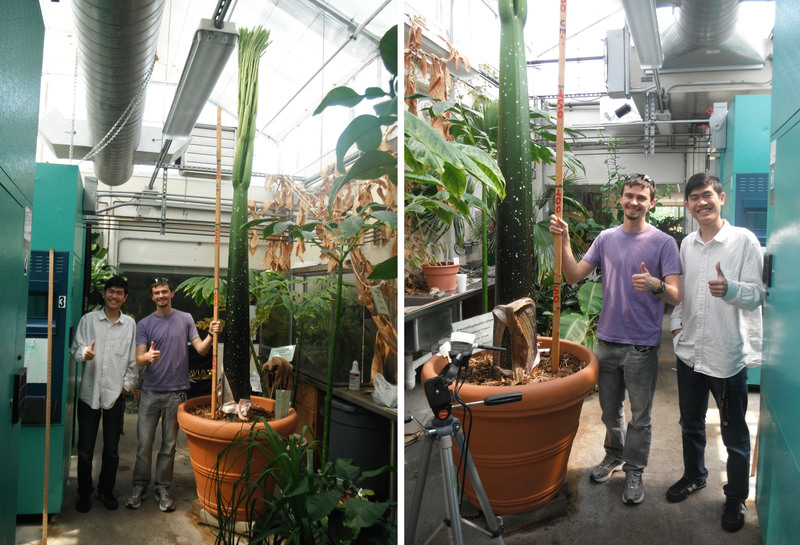 Perry’s exuberant leaf grew from 61 inches on Monday, August 15 to 128 inches on Thursday, August 25, and is unfurling a bit. The earlier upward thrust had been almost entirely vertical. 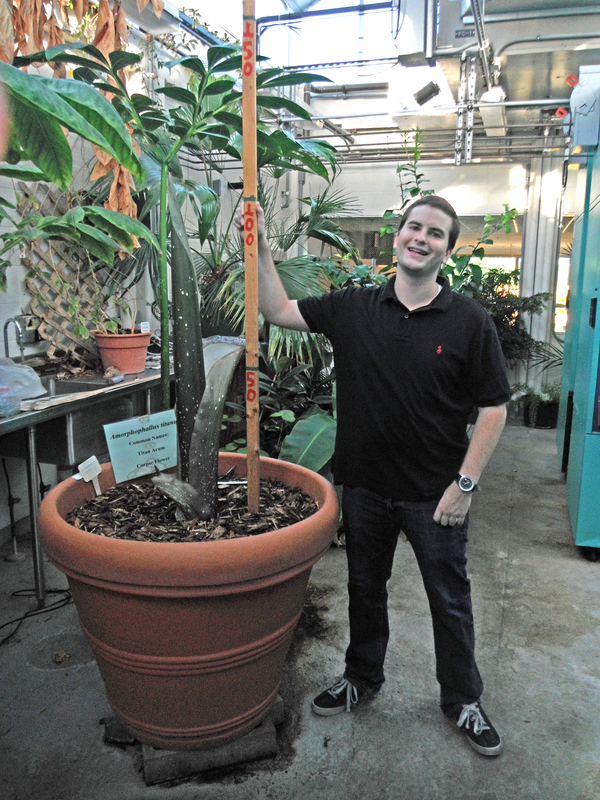 The girth of the base of the petiole at the time of the Tuan/Anthony visit was 29 inches. That’s a lot of girth – especially given that it was 24 inches on Thursday, August 18. Just think of the circular cross-section of the petiole, then think of the difference between a medium and large pizza. 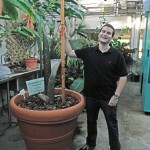 This is the largest sprout that you’ll ever see, so if you’re partial to salads and stir-fry dishes, or simply to botanical wonders, by all means stop by the greenhouse in the Nobel Hall of Science to view Perry. Take the elevator or stairs on the west side of the building, and walk toward sunlight. 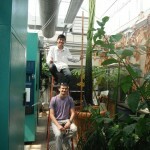 You’ll be able to see Perry through the greenhouse windows. If I or other accommodating persons are around, you’ll be welcome to go inside for a closer look. 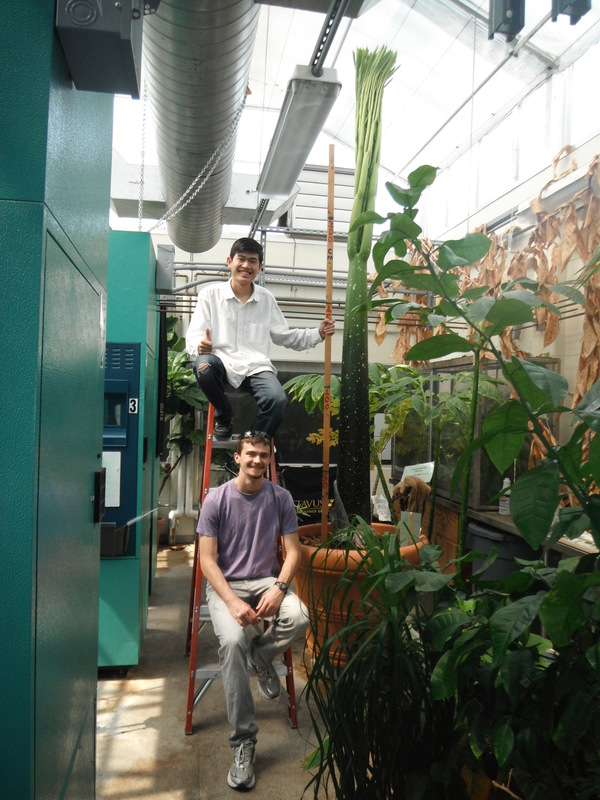 And you can, of course, always take a look at the Titan Arum Webcam (in continuous operation since 2007!). Excellent. I wish mine was doing so well. Thanks. The leaf is actually larger this time than last time (31-inch circumference at the base, as opposed to 28 inches last time).